When we set big financial goals, whether they're to pay off a massive amount of debt, save for a large investment, or to become a millionaire, we have to be in it for the long haul. 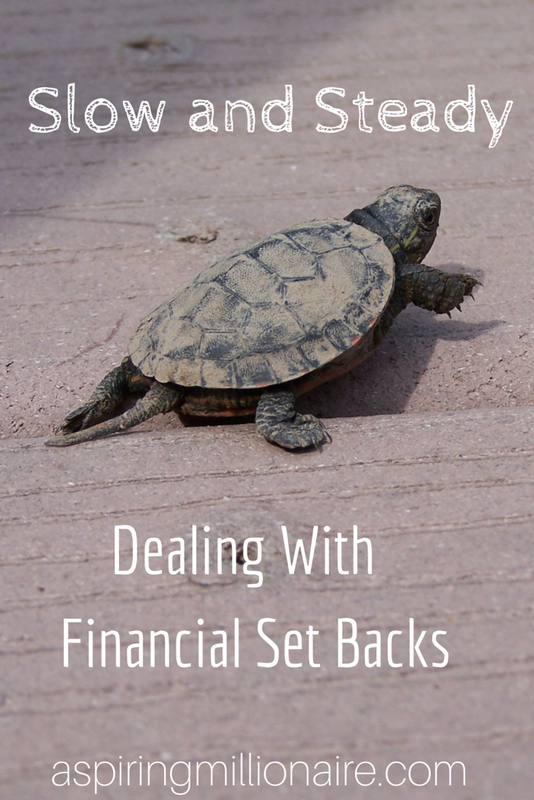 Big goals aren't achieved quickly, and along the way, there will be some financial setbacks. When those setbacks happen, it can be incredibly demoralizing. Just when you're finally feeling good about how much you have stashed in your savings account, you have auto problems and have to take out $1,000 for repairs. You're working hard and making good money, and then your company decides it has to lay some people off. You're 50% of the way to your goal, and then you find out you need some massive dental work. Whatever the setback is, meeting with it is a psychological nightmare. You can get discouraged, with thoughts of quitting starting to enter your head. "Why should I even try? I'll never make it." It's a dangerous thought process, because it is self-fulfilling. If you quit or give up, it is an absolute surety that you will never reach your goal. In reality, everyone has to deal with setbacks. We all have cars break down, disappointments in our career, unexpected medical expenses, and other situations that arise that seem to do nothing but affirm Murphy's Law. While it's true that some have more resources and advantages from the starting line, that shouldn't deter you. The biggest obstacle to overcome is that psychological one that tells you you cannot succeed. You can. You may just have to get creative, become adaptable, and above all else, not quit. It's a good thing to have concrete goals with a timeline to work with. It keeps you accountable. It keeps things measurable. But it can also make things discouraging. We tend to want things as quickly as possible in Western culture, so when we set our goals we have to be careful to make them realistic. It's a good idea to predict those unpredictable expenses that are bound to come up, and account for them in our timeline. If something comes up that threatens to completely derail your goal, rather than quitting because you won't meet it in perfect time, sit down and reassess. Make a new timeline that matches your current circumstances. Is your savings or pay off a couple hundred dollars short this month due to a setback? Get creative. You may be able to hustle a little harder this month to get to where you want to be, despite life's attempts to get in the way. If you need some inspiration, check out these 70 ideas to make money. Not reaching your goals based on a timeline that you set a year and a half ago based on an assumption that your life and situation would stay exactly the same does not make you a failure. Life is unpredictable. That makes setting accurate timelines tricky and potentially fallible. For anyone. You are not alone. Recognize that despite making the best decisions, there are many things in this world that are not in our control. Above all else, recognize that the "failure" to reach your goal was not in you. It was in the human inability to accurately predict everything that will happen in the future. Don't quit. Keep going. Big goals are rarely met quickly, but slow perseverance can lead to ultimate success, even if you hit a few road blocks along the way.